“We’re supposed to get a lot of rain,” said Emma turning off her computer. “Well, what’s a little rain?” We’ll be driving anyway,” I said. 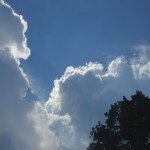 It was Wednesday in the early evening of September 7, 2011. I stepped into the car, turned on the engine and began driving through Albany traffic headed for Highway 88 and Waverly. It had rained hard the day before and periodically rain hit the windshield as I drove. Darkness fell and we still had a long way to go. After hours on the road, we approached Otego. We were getting close to Binghamton; it wouldn’t be much further. Then a few miles down the highway, we came to a road block and a large detour sign. I swung the car around following enormous semi-trailer trucks and other vehicles proceeding in a narrow line exiting the highway. The rain drummed hard on the asphalt and gloom filled the night. “I’m just going to stop here for gas,” I said pulling the car into a service station. I filled the tank and walked inside to pay the lady behind the counter. “Where does the detour lead to in Binghamton?” I asked. “The detour doesn’t go to Binghamton. It’s just directing you back to Albany. 88’s washed out. You can’t get through. Where in Binghamton are you trying to go?” she asked. “Actually, I’m trying to get to Waverly,” I replied. “Well, go up that hill, when you get to the top of the hill keep right until you come to Colesville Road that will take you to Binghamton,” she said. I walked out of the warm filling station and looked up the road. Cars and trucks were everywhere. Sheets of rain kept falling; I sat down behind the wheel and turned toward the dark country road, following several other vehicles up the hill and into the murky night. It was too dim to read the street signs but I followed the other cars until I saw another gas station. I pulled into the station to find out where I was. Lots of other drivers were there for the same reason; many large trucks were parked alongside the road. I climbed out of the car and waited as the station manager gave directions to a man holding a map. “Can you tell me how to get to Binghamton?” I asked the man. “Where are you trying to go?” he asked. “Actually, I’m trying to get past Binghamton to Waverly,” I replied. “You won’t make it. 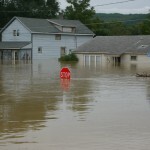 The highway at Owego is underwater,” he said. “Well, how can I get to Binghamton?” I asked again. We changed drivers and Emma took the wheel. She slowly pulled the automobile out of the station and turned towards the narrow winding road leading up a steep hill sticking close to a tractor trailer headed in the same direction. Our car became part of a long procession of trucks and a few cars. 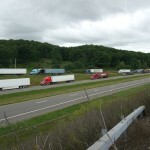 The cars and trucks creep over the rise finally coming to an entrance on Highway 86, the Southern Tier Expressway. Emma steered onto the highway and we made our way through Binghamton. The windshield wipers had a hard time keeping up with the falling rain. Emma strained to see the road. Rainwater made the road slick but it wasn’t flooded. “The man said we won’t get through Owego. It’s flooded,” I said. “Just keep going, hopefully there is a detour around Owego,” I replied. As we left Binghamton near Vestal we noticed an exit ramp closed and deep water on the street below. We drove past Owego. I looked out the window. Water lapped at the riverbank but not close enough to cross the highway. Owego wasn’t flooded. On and on we drove, passed Lounsberry and Nichols. The bright lights still shone at Tioga Downs Casino and Raceway. A little bit up the road from the Racetrack, the road passed around and up a steep grade, an embankment stood on the opposite side of the highway. Emma flipped on her hazards and slowed down. Rain gushed from the sky with a wild fury as the windshield fogged. Several trucks surrounded us. All of a sudden our car hit a stream of water which crossed both sides of the highway. On the upper portion of the expressway, in the opposite direction, trucks pulled onto the roadside. An emergency vehicle flashed red and orange lights. Meanwhile, a tractor-trailer truck zipped past us almost hitting our vehicle. The truck hit the stream with great force, creating a massive wave of dirty water which engulfed our car, blackening out everything. Emma couldn’t see and came to a complete stop as a big truck behind us blasted his horn. “Can you keep going?” I asked thinking that the car’s engine was flooded and we were stalled. On we drove exiting the freeway at Waverly, turning on to Broad Street and finally into our driveway. The hour was late and we were tired. After getting a bite to eat we turned in for the night, glad that we hadn’t become a statistic on the highway’s death toll list. As we slept, Tropical Storm Lee created havoc on the banks of the Susquehanna resulting in hundreds of people fleeing to emergency shelters to wait out the flood. 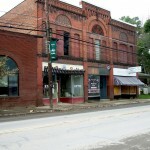 The next morning, the news spread and we drove down to Athens and Sayre to see for ourselves. We looked down from the overpass above Highway 86. The Binghamton exit and entrance were closed. 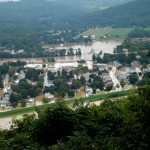 The highway from Waverly to Binghamton was flooded. A long line of trucks were parked along the highway unable to go any further. When we arrived in Athens; people milled around, rescue boats floated on the flood waters looking for stranded people, and canoeist paddled up the watery streets to look at their flooded homes. The Sayre and Athens bridges were closed, water lapping at their entrances. A search and rescue helicopter circled over head. 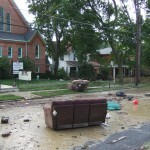 Garbage bags, furniture and submerged cars filled the brown putrid waters. The air smelled of petroleum and raw sewage. Friday, Emma and I drove up to see how Horse Heaven had made out during the flood. The barn is on high ground quite a ways from the river; however, many small creeks wind down from the mountain seeking the Susquehanna. Murray Creek had flooded across the road below the stables taking some of the road with it and leaving rubble behind. A road grader pushed rocks and mud off the street as we drove by on our way to the barn. “We didn’t get any water. We’re too high,” he said. “The creek below here must have flooded at one point,” I said. 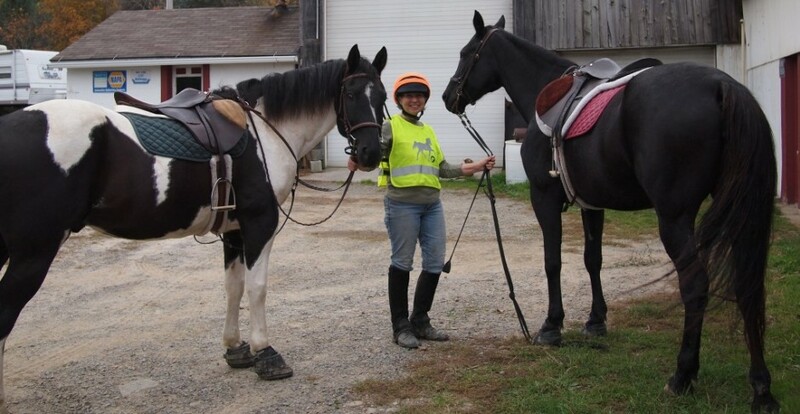 Emma and I brought CJ and Pepper in from the pasture, brushed them down and saddled up for our ride. We rode on Pump Station Hill Road and turned into the woods on the southside of the park, traveling up a steep trail hugging the ridge. There wasn’t much sign of flooding other than a lot of rocks and some deep ruts cut by fast moving water down the middle of the trail. The path was a little muddy but not bad considering how much water must have run over the ground a few days before. Noise filled the woods.“It sounds like there’s a lot of movement in the woods today,” I said. “I bet animals like groundhogs and rabbits had their burrows flooded,” replied Emma. The trail crossed the telephone/power line access road and the horses continued to wind their way through the woods. We came around to a path that skirts the eastside of the park, when our way was impeded by a massive tree. The tall maple had landed in the crown of another big tree and hung suspended about 3 or 4 feet off the ground completely blocking the trail. “Let’s try going around through the woods,” I said. “Ok,” said Emma reining Pepper into the forest looking for a way through the trees. The bushes obstructed our way and CJ became nervous. Emma turned around, “I don’t see a way through…maybe the other side,” she said. “Ok,” said Emma turning Pepper and heading back down the trail. We came again to the telephone poles and the grassy access road, “Let’s take a short cut and double back passed the abandoned house,” I said. We turned the horses around and headed down the hill. Suddenly, a deer bolted out of the forest, bounded through the grass a few feet ahead of us and disappeared behind some bushes as the rest of the herd ran through the woods. CJ shied wanting to head back up the hill, then the horses stood motionless, picking up their heads listening to sounds we couldn’t hear. We waited a few minutes before riding on. At the bottom of the hill, an enormous bull Hereford with a massive neck stood perfectly still under a tree observing our approach. The horses returned the bull’s stare as we walked onto the road that passed the old homestead. CJ and Pepper walked gingerly crossing in front of the bull which stood motionless several yards away. We kept our eyes on the animal when another big Hereford came into view several feet behind the bull. “Sure,” said Emma as the two horses took off up the road. A canter turned into a dead run. I glanced back over my shoulder and saw the bull running across the field, parallel to the road. The animal didn’t appear to be headed towards us but we didn’t take any chances. The horses ran to the hilltop where the gravel road crossed a trail through the woods and we slowed to a walk. “I don’t think he’ll come into the woods,” I said looking back down the road for the bull. “Where do you think he came from?” asked Emma. “I don’t know. Maybe his corral flooded and he broke loose,” I said. We rode about a mile and stopped the horses at an overlook. 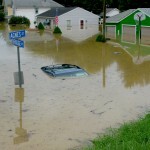 Sayre and Athens looked strange with so many houses and streets filled with water. We turned for home and put the horses out to pasture. A few days later a picture of the bull appeared in the local paper. The bull made it to the top of Round Top Park ate grass amongst the slides and swings until his owner came to claim him. A day or so later, Donna and I rode up Weaver Road headed for the park. I told her our experience the night of the flood, the truck and the deep water on the road. “That was a close call. Once I was driving in PA on a road which had reservoirs on both sides. It rained heavily and the reservoirs flooded across the road. A tractor-trailer truck drove through the water. The driver thought that it wasn’t very deep. The truck completely disappeared and the driver was never found,” she said. 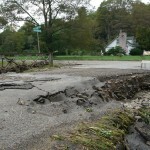 “A sinkhole had opened up under the road connecting the two reservoirs. The truck driver couldn’t see it from the road. The water didn’t look that deep, but when he drove his truck into the water; he hit the sinkhole and disappeared. They never found the driver or the truck,” she said. We rode to the overlook expecting to view the flood waters in Athens, but to our surprise all of the water had disappeared. 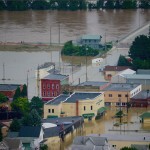 The river which had risen to more than 25 feet had receded but the damage was far from gone. 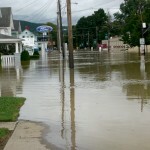 Not only were Athens and Sayre flooded, every town between Waverly and Binghamton flooded as well. President Obama declared the area a national disaster area, FEMA came to help, the clean up would cost millions and the damage could last for years. This entry was posted in Uncategorized and tagged driving hazards, escaped bull, flood, national emergency, Sayre and Athens flood 2011, Susquahanna River floods. Bookmark the permalink. I so enjoy your blog. My horse, Joker, was the first “official boarder” at Horse Heaven, many years ago. Shortly after that, Connie bought the wonderful Ruth, and I rode her from her previous home to Horse Heaven. Connie and I did trail riding in those days, trying to open up some trails and exploring Round Top Park. I then acquired other horses and started my riding program, Mack Ponies, at Connie and John’s farm. I specialized in beginner, both adults and children, and saw many people realize their dream of actually learning to ride a horse. Not having and indoor made it hard to keep the program going, but we kept at it for several years and a lot of smiling children and adults leaned to ride. Thank you for your wonderful comments. I would have loved to have seen the riding school. It must have been rewarding to help people, young and old, learn the joy of horseback riding. The best to you and your family – Happy Holidays! I am just catching up on your blogs and enjoying each and every one….It certainly does bring back memories-thanks….